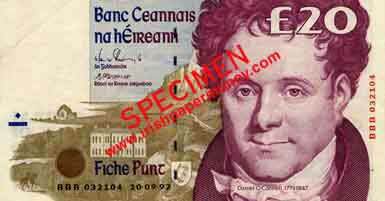 Listed following are all of the known dates of Irish replacement notes, along with recorded prefix brackets. There is a replacement note section on the main web site with illustrations, and there are pictures of most replacement note dates in the View by date sections on the web site. Always trying to improve the range of known numbers. Occasionally a note which expands the number range turns up. Anyone with a note outside of the number ranges here is invited to send a scan of the note. 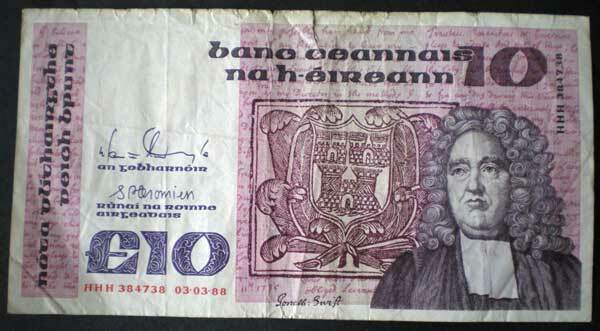 Central Bank of Ireland, Twenty Pounds V replacement note. 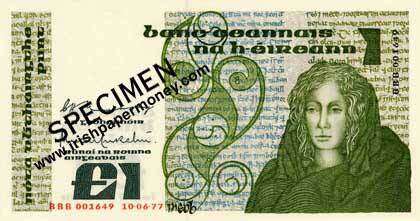 (ii) Double 0 plus letter prefix (£1, £5 only) – Banknotes printed by The Central Bank of Ireland itself. 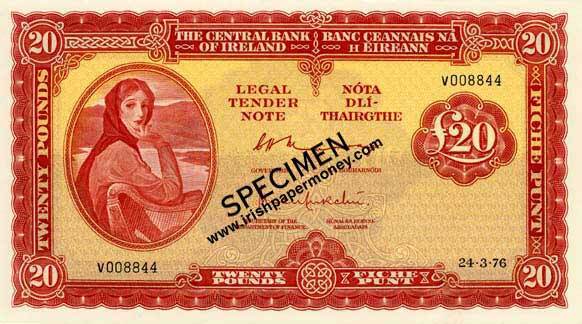 Central Bank of Ireland B Series One Pound BBB replacement note. Central Bank of Ireland C Series Twenty Pound BBB replacement note. The Very first date of C Series banknotes exists only as a £20 replacement prefix. It is a probable trial run of the new note design. Here's a £10 note 3/3/88 which expands the HHH numbers by about 12,000. Updated Series B first date replacement notes AAA 032128. Scarce notes, it is seldom that the number bracket gets expanded on these. Replacements of those early dates are scarce. Have the number 1 notes for this date, replacement and non-replacement survived? These would be the first issued notes for the B Series. I have the following replacement note... E–112Z Type 14	2.12.76	T578902 in uncirculated. I beleive this to be a new high serial number. Nice. Could you post a picture of it please, or send it by email. That was a stroke of luck and well spotted by this collector. Replacement notes from this era often went unnoticed.